ISLAMABAD — Pakistan said Thursday it has given a “dossier” to Afghanistan containing evidence that fugitive militants are using the neighboring country for terrorist attacks against Pakistani security and civilian targets. The move came as a senior American diplomat, Alice Wells, arrived in Islamabad for “several says” of talks with Pakistani officials on how to promote peace and stability in Afghanistan. Foreign Ministry spokesman Mohammad Faisal says the dossier was delivered through the Afghan embassy in Islamabad. It contained proof that a recent deadly suicide bombing of a military base in the northwestern Swat district was plotted by the outlawed Pakistani Taliban operating in Afghanistan. The bomb blast early last month killed at least 11 Pakistani soldiers and wounded 13 others. Faisal said that evidence also has been provided to Afghan officials about several other terrorist groups, including Jamaat-ul Ahrar, or JuD, maintaining “hideouts” on the other side of the largely porous border between the two countries. He said Kabul has been asked to take action against the terrorist hideouts being used for “financing, planning and undertaking cross-border terrorist attacks” on Pakistani military posts, cities and towns. “We have shared the locations of the safe heavens of these groups with Afghan and the U.S. authorities on many occasions, however, our concerns have not yet been fully addressed. This issue has been addressed in some locations where Afghanistan has established its border posts and deployed troops,” Faisal told reporters at his weekly news conference Thursday. There was no immediate reaction available from the Afghan government to Pakistani assertions. A Pakistan military spokesman, Major-General Asif Ghafoor, revealed a day earlier that security forces recently have arrested 16 would-be suicide bombers, including nine Afghans. Ghafoor said all the bombers had come from Afghanistan to carry out terrorist activities. 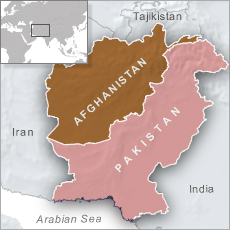 A U.S. drone strike earlier this month in an Afghan border region killed at least 21 fighters and commanders of the Pakistani Taliban, a move Islamabad welcomed. Afghan authorities, for their part, have been accusing Pakistan’s military institutions of supporting and harboring sanctuaries of the Taliban and its allied Haqqani network that is waging deadly attacks on Afghan and U.S.-led international forces in the country. The allegations and counter allegations come as Pakistani Prime Minister Shahid Khaqan Abbasi is scheduled to visit Kabul next week at the invitation of President Ashraf Ghani for bilateral talks on reducing tensions, and improving trade and economic ties. The Trump administration has been pressing Islamabad to take decisive action against alleged Afghan Taliban sanctuaries on its soil and also recently suspended military assistance to Pakistan until it delivers on counterterrorism pledges. Officials in Islamabad reject the charges, saying no insurgent hideouts exist on their side of the border. Tensions in bilateral ties have deteriorated in recent months. Both sides insist, however, a diplomatic re-engagement has been underway to address mutual concerns. The State Department’s Wells is in Pakistan where she has held talks with senior officials on developments in Afghanistan. Spokesman Faisal said Ambassador Wells held a meeting Thursday with Foreign Secretary Tehmina Janjua. The discussions are focused on issues including Pakistan’s counterterrorism efforts and the regional situation in Afghanistan in the wake of U.S. President Donald Trump’s South Asia policy, Faisal said. “The two countries are maintaining regular engagement to address the common challenges and take the relationship forward,” the spokesman said. See how the rats are conducting negotiations all over the globe while cowardly committing heinous crimes in the country- obviously, it ii is a form of bizarre survival skill and mechanism; (albeit, immoral), that they have developed for themselves. You must get ready likewise- they are genuinely there to mess you up !